The winner goes to Super Bowl XLIX in Glendale, Arizona. Well, they likely will not become famous during a post-game interview with Erin Andrews. 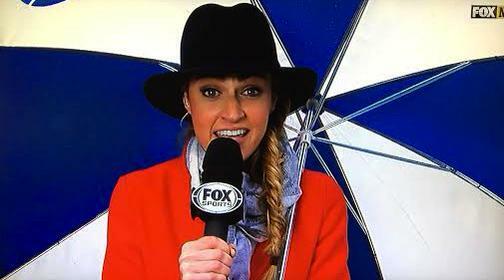 3:05 – Before kickoff, we are reminded that Erin Andrews is dressed like Carmen SanDiego (in part due to the less than ideal conditions including rain…The Packers are on offense first and to surprise of no one, these fans are geeked. 3:13 – Rodgers goes after Sherman on a throw to the end zone and gets picked after a decent drive. Nice try with Adams but they aren’t going to win the Adams vs. Sherman matchup often. 3:16 – Sherman with an interception in second straight postseason game. 3:18 – TIP DRILL. Russell Wilson throws interception after a deflection on 3rd and 7. Haha Clinton-Dix returns it inside the SEA 5 but a PF penalty pushes them back to the SEA 19. 3:22 – Pack dents the scoreboard first with a John Kuhn TD…on second thought, maybe not. Looks like his elbow hit the ground before he crossed the goalline. 3:27 – Kuhn play is reversed. No TD. Lacy is stopped on 3rd and goal from the 1. Go for it on fourth? Nope. Field goal time. Mason Crosby from 18 away. Field goals don’t win championships. 3:31 – Packers get the ball right back after Doug Baldwin fumbles away kickoff. Golden opportunity for Pack. 3:36 – Green Bay can’t covert a goal to go into a touchdown. Another field goal try for Mason Crosby. 3:38 – Seattle goes three and out. Time for their receivers to add more people on the list about how much people dislike them. 3:46 – Packers in the red zone AGAIN. 3:50 – Rodgers hits Randall Cobb in the end zone for six. Man, the wheels are coming off the Seattle bandwagon quickly to end the first quarter. 4:02 – Long Packers drive culminates in a…FIELD GOAL. Once again, the Packers dial up Mason Crosby after a missed 3rd and 3. 4:07 – Earl Thomas heads to the locker room. Pack have held ball for nearly 17 minutes. 4:11 – HAVE A DAY, HA HA CLINTON-DIX! He picks off Russell Wilson. 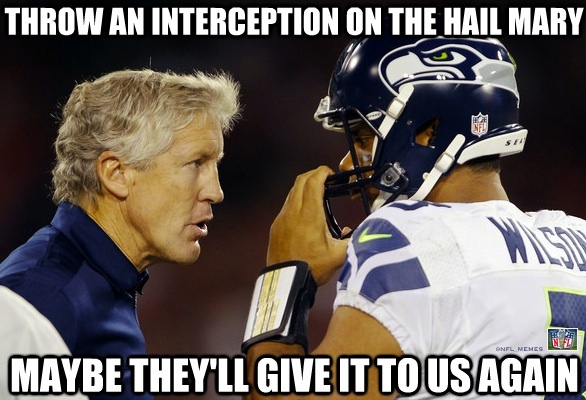 The Seahawks have 11 yards of total offense and three interceptions. Just awful. 4:15 – Packers bail out Seahawks with Rodgers getting picked by Byron Maxwell in SEA territory. GB Glass half-full: 3 takeaways, 6-6 in plus-territory poss., up 16-0. Half-empty: 3 takeaways, 6-6 in plus-territory poss., up only 16-0. 4:19 – A Seattle receiver gets open! For a first down! In the red zone! Rejoice!! 4:25 – Hey, guess what? ANOTHER INTERCEPTION FROM RUSSELL WILSON. Seriously, no receivers are open. Sam Shields with the interception. 4:32 – Packers punt it away with under a minute left. Wilson darts around to try to pass but gets sacked on first down relatively deep in Seattle territory. 4:35 – Halftime in Seattle…and that was probably the worst 30 minutes of football the Seahawks played all season. SUMMARY: Welp, that’s as awful as the Seattle offense can play. Can only go up from here, right? 5:00 – Marshawn Lynch is getting the legs rolling as the Seahawks make their way into Packers’ territory. 5:01 – The Seahawks keep flushing away all of their good will. A Clay Matthews sack back into Seattle territory is promptly followed by a personal foul against the Seahawks. 5:05 – Green Bay, a courteous guest, allows the Seahawks to convert on a 3rd and 19 throw. Awful D there. This Seattle drive is taking forever. Already under six minutes left to go in the third quarter. 5:06 – Packers linebacker Sam Barrington breaks up a pass intended for Marshawn Lynch. 5:08 – Seattle appears to be going for a field goal….BUT. FAKE FIELD GOAL FOR SIX. Gary Gilliam – a reserve offensive lineman draws Seattle closer. 5:16 – Packers go three and out on cue…Also, Rodgers twists his ankle to boot. The worm has turned in Seattle. 5:18 – No truth to the rumor that the Colts and Patriots are trying to petition league to have Super Bowl moved to next Thursday. 5:21 – Seattle can’t muster anything on next drive and go three and out to temporarily thwart momentum. Green Bay takes over again but has a little more success this time around on the ground. Lacy converts on a 2nd and 5 to move the sticks for Green Bay as the end of the third quarter arrives. 5:24 – A 32-yard run by James Starks is the longest play of the day…for either side. 5:27 – Mason Crosby closes the drive with a big 48-yard field goal to put the Packers up by 12. On a side note, Rodgers hasn’t needed to make any huge “gotta have it” throws in this game because of how it has played out. Major advantage for Packers. 5:48 – Packers go three and out. Another big stop needed by the Packers defense. 5:51 – Green Bay comes up with its fourth interception after Jermaine Kearse fails to hold on near midfield. That should just about do it with roughly five minutes left to go. Incredible that a one-legged Aaron Rodgers will make it to the Super Bowl. 6:03 – Russell Wilson scores on a bootleg to draw the game closer. If this thing is settled by a hail mary…the world is going to blow up. 6:06 – SEATTLE RECOVERS THE ONSIDE KICK AFTER A MUFF BY THE PACKERS. Oh no…Packers fans probably don’t deserve this. 6:09 – Lynch rips off a big run to score a TD with just under 90 seconds left. Wilson follows up with the most ridiculous two-point play ever. Throws a rainbow across his body with defenders hanging around Luke Willson. 6:18 – Incredibly, Packers rally down field and get a Mason Crosby 48-yard field goal despite Rodgers gimping his way downfield. Crazy stuff. 6:31 – The Seahawks complete the comeback after Wilson goes beserk in overtime on consecutive long throws to Baldwin and then the game-winner to Jermaine Kearse. 6:39 – One of the greatest games ever, period. 6:40 – The Seahawks will be awfully chatty for two weeks…but they deserve to be. The Champ is still here.